Certainfil Cavity Insulation Limited uses a high grade silver graphite expanded polystyrene bonded bead (EPS) system of installation. Silver graphite bead is typically 20% more effective at reducing heat loss than the older “white” bead that may also be offered by other installers. Beads arrive at your home already manufactured to the density required by the Agrément Board and they are simply blown into the wall from the truck and sprayed with an adhesive so that they form a bonded mass. Because installation of cavity wall insulation is done externally there is no need for anyone to be at home during the installation which is usually completed in one day. Bonded beads have a consistent density and cannot shrink or settle. That's why you can sit on a beanbag without compacting the contents. One could not imagine a void or space within the beanbag and in the same way such voids cannot occur in a bead filled cavity. Our specific drilling pattern outlined by a British Board of Agrément (BBA) guarantees that your cavity will be 100% filled with beads. Polystyrene bead is also a non absorbent material so will not soak water which is why it has been used for many years in the fast food industry to serve hot drinks. Certainfil Cavity insulation Limited do not and never have used a mineral wool system that may be offered by other installers. In existing houses, with unfilled cavity walls, the system is totally safe to use in brick walls, rendered walls and even in areas which experience driving rain. Newly built houses are much more susceptible to dampness than existing (cured) walls but in spite of this an ever growing number of builders are changing to bonded bead (ask to see lists of builders' names). The material only arrives on site the day it is to be injected so no storage is required. Cutting and shaping boards and batts are eliminated and of course the wastage that this entails. 6% - 10% saving in bricklayers time and costs. The bead reaches all parts of the cavity down to the point where the DPC exits at window heads. This eliminates large gaps in the insulation (usually 50cm) above windows and doors when an inspiration board is built in. No site supervision is necessary. Since insulating peaks is optional a further 10% - 15 % saving can be made if there is no living accommodation behind the gable peaks. The system of installation does not involve creating a density on site, so smaller and much fewer holes are required compared with other systems available. After 30 years of use throughout the UK the BBA state, "No failure of any bonded bead system has ever been reported to the Board." In NI the NHBC has never had a claim (dampness) involving bonded beads. The forthcoming new insulation standards for new walls in ROI can be met with Certainfil Graphite bonded beads. 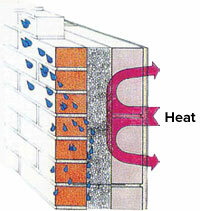 Rain can penetrate outer wall because masonry soaks. When the water reaches the polystyrene bead it is no longer being soaked. Gravity takes over and the waters natural tendency is to drain down the outer wall. Because there are mini air spaces between the beads there is ample space for the water to drain down. The introduction of the bead has not changed he way the cavity drained (and breathed) before it was injected with insulation. In an average situation a 100cm cavity filled with bonded bead will result in a SAP rating of approximately 10 extra points as compared with a built-in 60mm board and the new standards can be achieved at half the cost of extruded board.